I simply love stained glass. Not only is it beautiful, it's also one of the best ways to interpret the Scriptures in art. In addition, it may be a useful catechetical tool and oftens witnesses to the history of a place. In 2008, Pope Benedict XVI reflected on stained glass thus: "From the outside, [stained glass] windows are dark, heavy, even dreary. But once one enters the church, they suddenly come alive; reflecting the light passing through them, they reveal all their splendour. 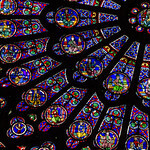 Many writers... have used the image of stained glass to illustrate the mystery of the Church herself. It is only from the inside, from the experience of faith and ecclesial life, that we see the Church as she truly is: flooded with grace, resplendent in beauty, adorned by the manifold gifts of the Spirit. It follows that we, who live the life of grace within the Church’s communion, are called to draw all people into this mystery of light."